Green oasis and gold kid leathers overlaid with multi-coloured leathers including maril (marbled leather). Design originates from the maps drawn by Professor Tolkein. Accompanied by a seperate felt covered folder in hand-made paper containing two maps (a green arrow showing the directional viewpoint of the landscape depicted on the binding).More notes on file. Coleman, M. (1973). Three British Book Binder. Crafts, (1), pp. 26- 31. Myers, R. (1977). Reviews - The Bookbinding Competition. Crafts, (24), p.47. 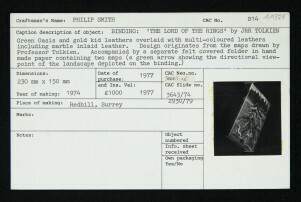 The Lord of the Rings, Philip Smith, 1974, Crafts Council Collection: B14. Photo: Todd-White Art Photography. "The Lord of the Rings" has been a recurring binding subject since 1963, this is something like the thirty-fourth binding of this book (some are in multiples such as the book-walls) which have varied in style from the abstract to the near figurative. This one is the most nearly literal landscape, although a profile face may be made out facing right (crowned by the black mountain chain) on the front board. It is one of the most delicate uses of feathered, snuffed aand ribbon onlays, and the first use made by the binder of puckered gold kid. See also extensive notes by Philip Smith on the Purchase Information Sheet.